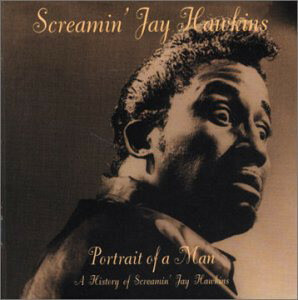 Definitely one of Screamin’ Jay Hawkins more tender moments, Portrait of a Man is the title track from an album of rarities and obscurities. This collection also includes classics like I Put a Spell on You (this being the original version), Heart Attack & Vine, Mountain Jive and Armpit No. 6. I just love way this song can almost drive you to tears as the opening line painfully declares, “I am painting in oil, a portrait of a man, Who has taken all the heart aches, And all the pain he can stand” …I love Screamin’ Jay Hawkins in all his many guises, but this song captures the broken woes of a pained man with passion, dignity and glorious expression and for that it is truly moving.. Check it out above. This entry was posted in Blues, Delta Blues, R&B and tagged Blues, Delta Blues, R&B. Bookmark the permalink.